Client/Location: NECA/Tyne Pedestrian and Cyclist Tunnels, North East, UK. The North East Combined Authority (NECA), a legal body combining the seven councils serving County Durham, Gateshead, Newcastle, North Tyneside, Northumberland, South Tyneside and Sunderland instigated the refurbishment works of the historic Grade II-listed Tyne Pedestrian and Cyclist Tunnels as part of its heritage program. The multi-million pound project, which will include the replacement of two of the original four escalators (largest wooden escalators in the world) with inclined lifts and the replacement of the tunnels’ ageing mechanical and electrical systems. The restoration project has been approved to serve the local residents with easy pedestrian access to both sides of the Tyne river, whilst also support local heritage sites seen as iconic locations in the North East, UK. Phoenix Eye was tasked with providing a cutting edge, integrated site security system, including access control and CCTV, for the contractors and sub-contractors working on the project for the 18month development schedule. The system had to be IP rated due to the outdoor environment of the access point of the site and needed to be simple, effective and reliable. The location of the site on the river bank also required robust endurance to withstand varying weather and environmental conditions. The site required two access points, on the North and South side of the river, each with access control and CCTV connected via a stable WiFi connection. A fingerprint biometric solution was used to reduce costs and reliance on secondary credentials being used, and also due to the fast, effective nature of the technology. Using sophisticated ‘Eye Access’ systems, each of which consists of single full height bi-directional turnstile; two ievo ultimate™ readers (one each side of the turnstile) controlled by one ievo REV4 control board, partnered with a CCTV (‘Eye Tower’) system, Phoenix Eye were able to securely protect both the North and South entry points to the project site. Utilising the IP65 rating of the ultimate reader and the PoE option were vital in fulfilling the standards set out by Phoenix Eye’s cutting edge solutions. The workforce enrolled on the ievo system using the ievo desktop registration unit and time and attendance was monitored with the Paxton timesheet software. 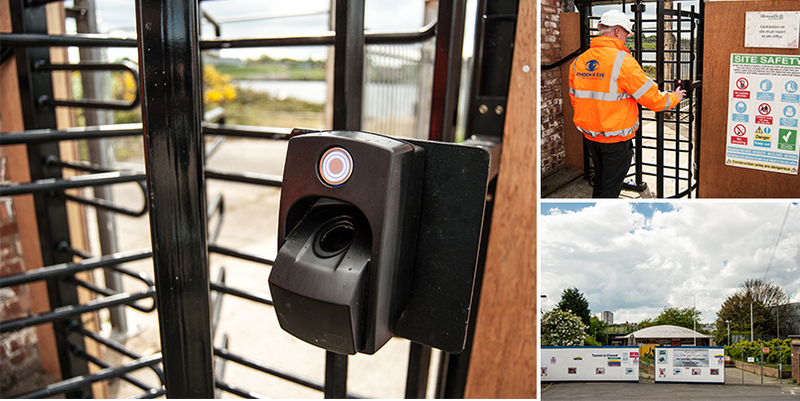 The simple and adaptive nature of ievo and Phoenix Eye solutions meant that the entire access control and CCTV was set-up and running within a week. The site team were highly impressed with the ease of use of the biometric access control system. Vastly improving on the antiquated and time consuming tag system previously used whereby a numbered tag and sign in a book were used to register being on site. The Eye Access system takes care of all of this by registering an employee’s biometric data and allowing the system to determine identification of a user and providing access depending on their access credentials. Since installation the site team have noticed a significant increase in efficiency and enhanced monitoring of attendance.